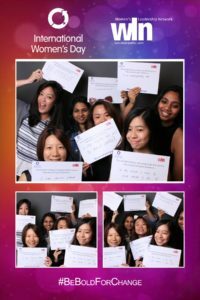 WLN Singapore hosted a fun evening of networking and panel discussions under the theme of ‘Ask me Anything’ – to celebrate International Women’s Day 2017 #BeBoldForChange. Nadia Tuma-Weldon, SVP and Director, McCann Truth Central moderated two panels focusing on “Now” leadership and “Next” leadership across the IPG network. The attendees were asked to make pledges on “the one BOLD thing you will do this year to help advance/inspire women”.